The Times Union Center, victim to many renamings, rebrandings, and rehauls, was first opened in 1990, christened with a performance from Frank Sinatra. Along with the Saratoga Performing Arts Center (SPAC), the Times Union Center is one of the largest and most popular music tour stops in central and upper New York. It has sold out more shows than any performance center in big cities such as Philadelphia and Miami. Along with The Egg, the Times Union Center is one of the most notable performing arts centers of the Capital District, with headliners that have included Frank Sinatra, Green Day, and Elton John. Upcoming events even include big names like Ariana Grande, Amy Schumer, Lynard Skynard, and Cage the Elephant. 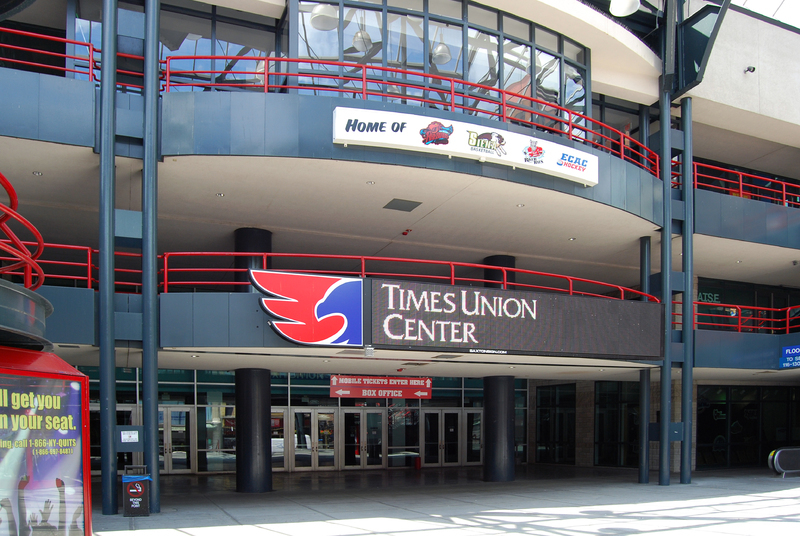 In 2008, the Times Union Center was the host to the longest hockey game in the history of the American Hockey League. At 5 hours, 38 minutes, and 36 seconds, the Albany River Rats lost to the Philadelphia Phantoms, 3-2. Alongside this record is the record for most saves, with Albany’s own Michael Leighton saving 98 times! Between 1990 and 1995, The Grateful Dead performed at the Times Union Center thirteen times. 1 "Did You Know?" Times Union Center. Accessed March 28, 2016. http://www.timesunioncenter-albany.com/center-info/did-you-know/. S. C. Kaufman, “Times Union Center,” Albany Walks for Health, accessed April 20, 2019, http://www.albanywalksforhealth.com/items/show/92.